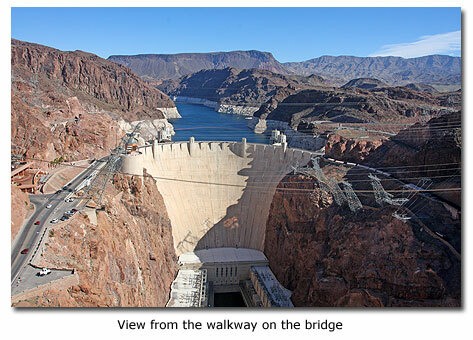 The Hoover Dam is an awesome engineering feat. It took five years to complete and was built using three and one-quarter million cubic yards of concrete. That's enough concrete to pave a 16 foot wide road from New York to San Francisco, CA. 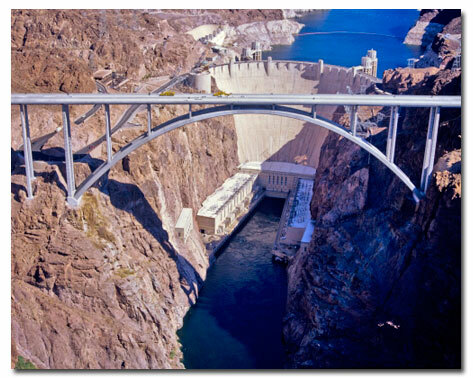 Since the bypass bridge was finished in October 2010, the Hoover Dam has become even more amazing. The graceful, concrete arch is designed to support the bridge. Its curved shape spans the gap of Black Canyon. The bridge connects Arizona and Nevada, and creates a faster route across the river. It's open to traffic, and has a sidewalk as part of the pedestrian and visitor amenities, which include a parking lot, trail, and interpretive plaza. 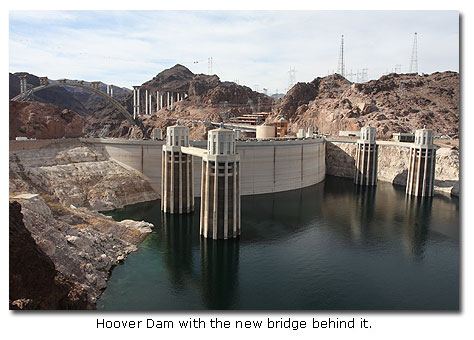 When under construction, the bridge was referred to as the Hoover Dam Bypass Project. It is now named the Mike O'Callaghan-Pat Tillman Memorial Bridge. O’Callaghan was a former governor of Nevada and former executive editor of the Las Vegas Sun. Tillman was a professional football player for the Arizona Cardinals who joined the Army in 2002 and was killed in Afghanistan in 2004. The Hoover Bridge bypass re-routes U.S. 93 traffic 1,700 feet downstream from the dam. It's suspended by a 1,060 foot, twin-rib concrete arch, the largest of its kind in North America, and is 1,900 feet long. 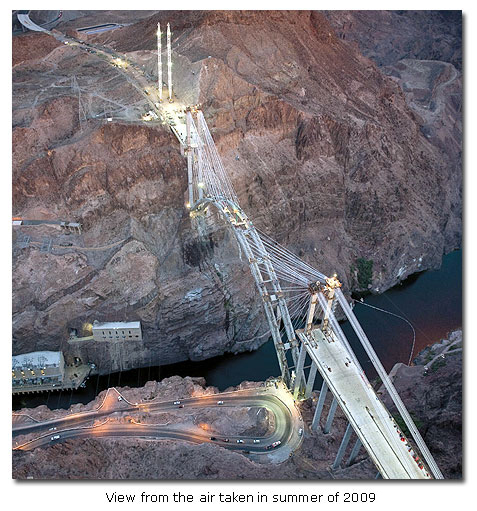 The bridge is 890 feet above the Colorado River. 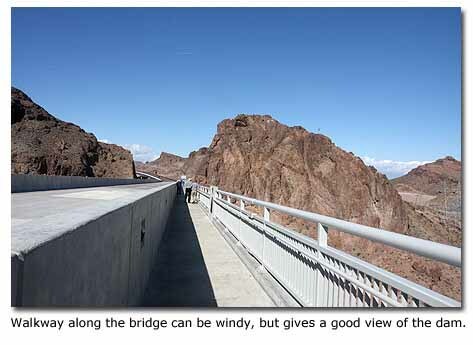 The bridge consists of four lanes and alleviates a number of problems associated with the old U.S. 93 that passed over the Hoover Dam itself. The narrow, winding two-lane road could no longer handle the 14,000 cars that passed over the dam daily causing congestion. The design of the road was dangerous with two hairpin turns, blind curves and pedestrian traffic. There were also vehicle restrictions on the Hoover Dam and loaded trucks and buses with luggage couldn't pass over it. 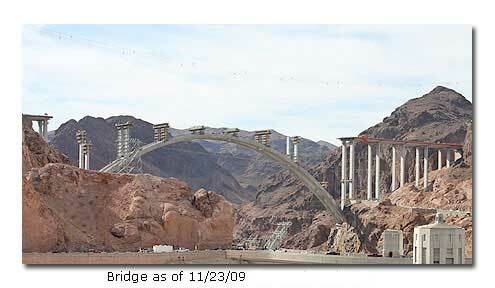 Since 9/11 trucks and other unauthorized vehicles had to go through Laughlin, NV to cross over the Colorado River. Other vehicles were subject to inspection due to increased security. The new bridge speeds up travel across the Colorado River and provides a much safer route. The bridge portion is only one part of the large project. The approaches to the bridge on both sides have required a lot of money to build and some creative engineering. On the Arizona approach, a 900-foot bridge had to be built due to the terrain crossed, adding $21.5 million in costs to the project. On the Nevada side there were six new bridges built at a cost of $30 million. There is also nearby parking, and a pedestrian walkway on the bridge that provides spectacular views of the dam from a new perspective. The total estimated project cost was $240 million. It was funded by the federal government ($100 million); by Arizona and Nevada, who each spent $20 million; and the balance will be paid for by bonds. The project was expedited after the tragic 9/11 terrorist attack. Security on the dam became a big issue; this prompted the project's start sooner than originally intended.